Table of contents for this formwork materials page. This formwork materials page came about after a couple of emails from Tommy Sanford, 90% of what you see here is Tommy's work. I have just a couple of photos. As I said to Tom, 50% of what he sent me I was new to me and the rest I'd forgotten, so once again a new friend on the Internet has given my a push and got my act into gear. Tommy says in his intro, "I have lived in the Philippines, a 3rd world country. for about 18 years. I was a general contractor in the USA 25 years before that. My fun is studying form work, designing it.". Only demanded in construction when in it must be molded vertically or suspended horizontally. The number of repeat uses. The acceptability of cold joints. Generally speaking, the faster you can strip the less wear on your forms. The faster you strip the greater the damage to the concrete possible. In the 3rd world I try to strip in 6 hours so I can get 2 casts a day and keep the crew busy. The smother the surface and stiffer the form will determine the earliest strip times. Note! When we say advantages or disadvantages, we are only talking general terms, as formwork jobs come in all ranges and one persons crippling cost disadvantage may be insignificant to another. Formwork materials - Rough sawn timber used as formwork here to provide an architectural effect. high labor as each set must be "re-built"
leaves a dusty finish as there are sugars in the sap of soft woods. 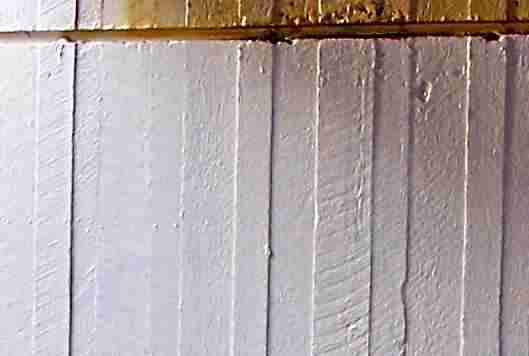 Advantages:-Same as above for untreated timber but a smoother finish. Disadvantages:-	Same as above but greater cost and availability in some countries. vinyl and water resistant glue surface. Simple oil based paint will increase the number of uses by double as long as the edges are not exposed to setting cement. If uncoated surfaces are exposed the number of uses will equal un treated plywood. release agents almost a must. 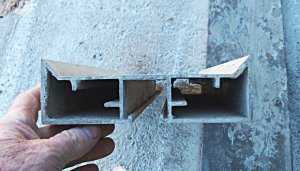 Example, cast cement in hollow blocks use a steel form. Very smooth surfaces are possible. STRONG and can be stripped late. many flooring systems use steel form as re-enforcement for single use. Formwork materials - Permanent formwork that is left in place and becomes part of the structural strength of the slab. The steel angles around the perimeter also can be said to be part of the formwork. Costs are 6 to 10 times a plywood form and much higher for specialty forms. The thicker the surface of the steel sheet, the greater the weight. Release agents are demanded as, if not used, cleaning labor will quickly overcome any economy gained by durable surfaces. 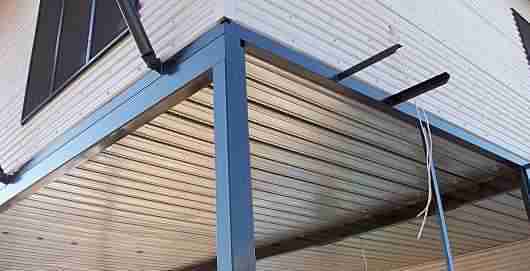 Steel dents easy, so if your boys claim it is 'strong as steel' soon your formwork will be very much less than flat. Formwork materials - permanent formwork for a column. In this case steel spiral formed on a machine primarily used for air ducts. Concrete pipes are also popular permanent column forms. Formwork materials - Aluminium extrusion edge form for tilt slabs. Formwork materials - Cement blocks produced in steel forms in their thousands, are in turn used to form complex reinforced concrete walls. I have not seen non-custom fiberglass systems, but they may be out there. A good use for fiberglass pans would be center floor decks in a high rise where the underside of the floor was visible, or in custom arch. designs on exterior of building. Very smooth clean lines in unusual shapes are possible. Many re-uses, 1000's depending on handling. long lead times. Building fiberglass forms requires first to build a form to shape the glass, then each cast has considerable work before your first concrete cast is possible. Not as heavy as steel, but usually cast in such large sections weight exceeds the ability of non mechanized handling. Mostly for basements where nice finishes are needed. some very nice designs or finishes are possible, "brick" look or "rock wall" look are some examples. Can be very costly to buy. Commonly called "pre-cast". Shapes that are built in such a way that when concrete is added it will build the final structural shape and are never "stripped'. A single form can be used to build components of a large cast increasing form repeats and decreasing the amount of forms needed. It is possible to cast light shapes to build beams and hold dead loads. Set times before handling are a factor. Must be built strong enough to resist normal loads plus handling loads (increased re-bar). A system where a fabric membrane is stapled to very lightweight forms. Used in the production of small moulded concrete pieces that would be extremely hard by other means. The rubber nature of the mould allows it to stretch when being stripped off the piece. Typically used as a cottage industry type business making moulded garden ornaments etc. Used vegetable oil, works OK and is cheap, will not leave a stain on new concrete. a good source is fast food restaurants like Mac Donalds. will rot plywood eventually. Used motor oil. Works well, can be very cheap if you live near a dump. It is really dirty to use and stains the concrete. Grease and diesel, works OK... clean to use, a little expensive if the project is large. Parafin and diesel, works well, fairly clean and no residue on concrete. (heat diesel until the candle wax melts, a really hot day will do it or bucket with glass over it on a hot day.) Cheaper than grease and improves the number of uses as, each use the diesel evaporates leaving your form coated in parafin. Parafin will not allow you to repair paint type coatings as paint won't stick to it. Not so cheap. Go To Top :Formwork materials and systems. << BACK: Raft slab formwork.